Heavy traffic on narrow roads could be one of the leading causes of traffic congestion, which also applies to communication networks. If more data is collected than the allowed data capacity can accommodate, communication latency results. This has a devastating effect on 5G-based internet services such as self-driving cars, autonomous robots and remote surgery. A research team led by Professor Kyunghan Lee in the School of Electrical and Computer Engineering at UNIST has proposed a novel technique that can reduce the congestion issues in the network environment. The team presented their latest work, "ExLL: An ultra low-latency congestion protocol for mobile cellular network" at the ACM CoNEXT 2018, held in Heraklion, Greece, on December 6, 2018. According to the research team, the new technique has superior performance over Google's Biblio (BBR), which is known as the best low-latency transmission protocol. The performance evaluation and verification were undertaken at home and abroad in collaboration with Professor Sangtae Ha's research team from University of Colorado Boulder, which boasts a mobile communication network testing facility. Communication delay is a phenomenon in which when untreated data accumulates in the network, causing data transmission delay. This is also called "buffer bloat." When buffer bloats are observed in the data center or the mobile communication network, the transmission of packets is delayed and the efficiency of data exchange and service quality are reduced. A solution to this is a low-delay transmission protocol. It is a method to grasp the network situation and adjust the data transmission rate and reduce the delay. In order to understand the amount of network bandwidth that can be handled by the network in the past, a method of probing the network state has been used by increasing or decreasing the transmission amount per unit time. The amount of data transmission is controlled while considering the change of the delay performance according to the increase or decrease of the transmission amount. However, Google's BBR has not reached the ideal minimum (slowest) performance while sending the maximum data allowed by the network (maximum data rate). "It is difficult to achieve the ideal performance due to the inefficiency of the search itself in the existing technique," said Shinik Park, the first author of the study. "This technology is a smart phone, "We have solved the problem by changing only the transmission protocol of mobile communication terminals." The researchers focused on elaborating the allowed network capacity for an efficient low-latency transmission protocol. If the amount of data sent is only as much as the network bandwidth allowed by the mobile communication terminal, the data will not be unnecessarily accumulated. To do this, the researchers observed the pattern of packets received by the mobile communication terminal and directly inferred the bandwidth of the mobile communication network. "In LTE networks, the pattern of the amount of data received per millisecond and the interval of arrival of packets during this time is different," says Junseon Kim in the Ph.D. program in Computer Science. "This depends on the resources allocated to the base station and the channel conditions, so it is possible to know the allowed network capacity by analyzing it, and if the observation time is different, it can be applied to the 5G network." Once the allowed network capacity (baseline) is known, the mobile communication terminal simply transmits the calculated reference to the server, and the server directly controls the data transmission amount of the mobile communication terminal. If the current throughput is less than the allowed network capacity, it will increase the throughput rapidly. If the current network capacity is almost reached, it will be increased finely. "ExLL can eliminate inefficiencies in the search process and implement ultra-low latency networking," says Professor Lee. "It is an existing low-latency transmission protocol that plays a major role in remote surgery, remote drone control, and 5G-based autonomous navigation." The low-latency transmission protocol was developed after the buffer buffer concept was defined in 2011, leading to Google's BBR. Google has included BBR as one of its transport protocols since 2016, and recently added BBR to the Google Cloud Platform (GCP). This is reminiscent of Google's adoption of its own development protocols (SPDY, QUID) in the HTTP / 2 and HTTP3 standards, which are web transmission technologies. 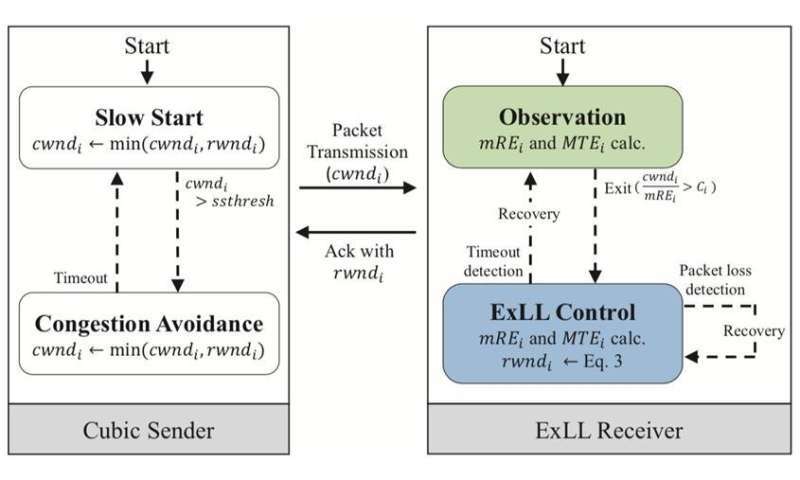 More information: Shinik Park et al., "ExLL: An Extremely Low-latency Congestion Control for Mobile Cellular Networks", ACM CoNEXT '18 Proceedings of the 14th International Conference on emerging Networking EXperiments and Technologies, (2018).